Some objects seem particularly suitable for use in preparing loudspeakers. Perhaps ping pong balls were favored objects for this due to their lightness and characteristic sound. Comparing several of these set-ups reveals that—fortunately!—using a similar technology can still result in completely different works. 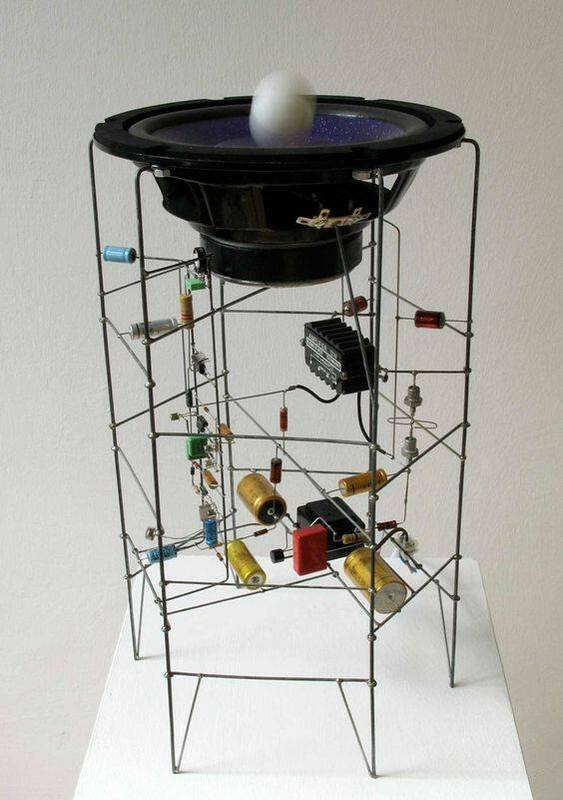 As far as I know, the first work using ping pong balls in combination with loudspeakers is Leser 1 (1967) by Manfred Mohr, who created the audio sculpture, and Jochen Gerz, who wrote the text for this installation. This tower contains 19 loudspeakers, each prepared with a single ping pong ball and was exhibited for the first time in 1968 in Paris. The audience can press a foot pedal to turn the installation on for a minute. Three different frequencies are then played through the loudspeakers and cause the ping pong balls to move away from the loudspeaker membranes and hit the plastic bag (see also the scheme at the end of this post). The ping pong balls alternate between striking the plastic bag and the loudspeaker membrane and the combination of 19 ping pong balls making this movement produces a noisy sound. Together with the text printed on the big plastic bag and a random letter printed on each ping pong ball, the whole installation seems to make an attempt to speak. The text itself seems also to be related to the movement of the ping pong balls: the big letters in the middle read: “Auf Flüchtlinge wird [ge]schossen”, which could be translated as “shoot the people fleeing”. Manfred Mohr explained me that this text refers to the fact that at that time, the East German police had the order to shoot people fleeing to West Germany. In Music for Pure Waves, Bass Drums and Acoustic Pendulums (1980) Alvin Lucier uses four bass drums and places them in front of four loudspeakers. A low sinus sweep is played through these loudspeakers and the membranes of the bass drums start to vibrate, according to their resonance to the frequency of the sinus wave. In front of each drum a ping pong ball is hanging from the ceiling, just touching the drum head. The vibrations of the skin push the ping pong ball away from the drum. Depending of the moment of hitting the drum, when the ball falls back, as well as the direction and amount of vibrations of the drum head, the ping pong ball will be pushed away next time with more or less force. 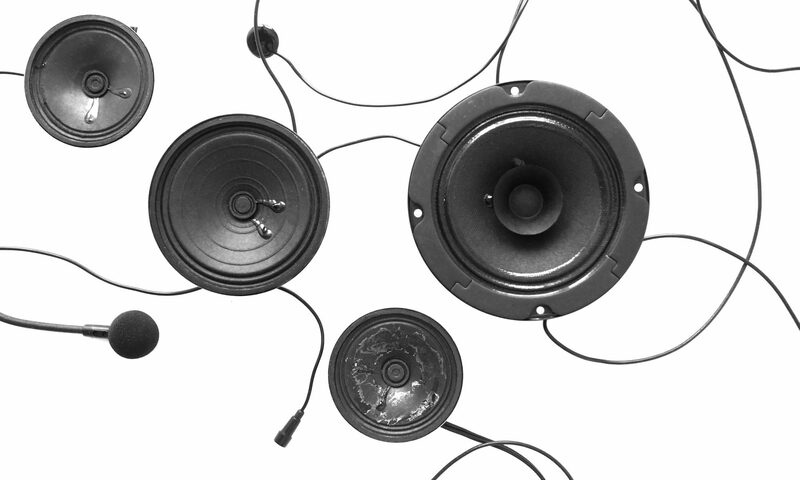 Although the set-up seems to be four versions of the same thing, the small differences—in material of bass drum, loudspeaker and ping pong ball—can be clearly perceived in the movement of the ping pong balls and the resulting sound. The shape of the ping pong balls reminds me of the head of a drum stick, and these drums seem mysteriously “played” by the ping pong balls. Christian Skjødt uses 16 loudspeakers and an equal amount of ping pong balls in Inclinations (2016). Here again each loudspeaker with ping pong ball combination creates its own rhythm, but due to the ping pong balls moving in an upwards direction, they fall down much faster than in Lucier’s set-up. This causes a constantly changing, soft, and noisy rumbling. Christian does not use any other material, such as a plastic bag or drums. Since the frequencies played through the loudspeakers are too low to be heard by humans, all sound is produced by the collisions of ping pong balls and loudspeaker membranes. The minimal visual quality of this installation underlines the focus on these sonic events. 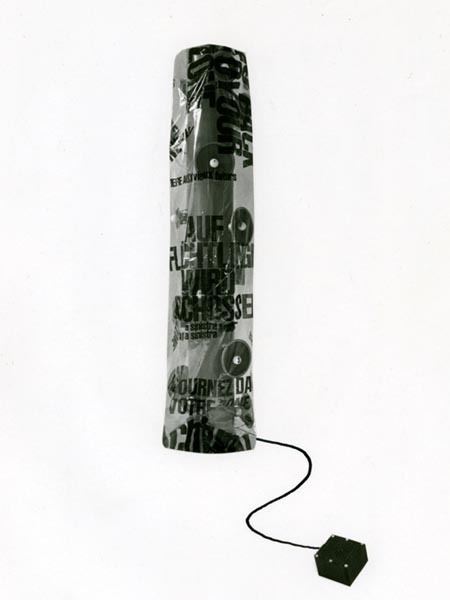 The three different relationships between ping pong balls and loudspeakers, from left to right: In Leser 1, the ping pong ball hits the loudspeaker and the transparent plastic bag. In Music for Music for Pure Waves, Bass Drums and Acoustic Pendulums, the loudspeaker just hits the drums. In Inclinations, the ping pong ball is placed directly on the loudspeaker.